When the International Union of Operating Engineers opened its new International Training Center on 237 acres in Crosby, Texas, earlier this year, it was designed to feature the latest equipment and product technology, says Chris Treml, IUOE Director of Construction Training. “It is essential that operators be trained on equipment that employers in the construction industry are using,” he said. To that end, the IUOE sought manufacturer partners to provide state-of-the-art equipment for the facility. Crane operators have access to the latest models of mobile, crawler, tower, and overhead cranes. DICA, Guthrie, Iowa, partnered with the IUOE by supplying multiple sets of SafetyTech Outrigger Pads and TrainSmart Pole Barrier systems. “As a leader in the outrigger pad and crane pad industry, we are very pleased to have DICA involved at the International Training Center,” Treml said. “The new state-of-the-art IUOE Training Center is a first class operation run by first class people. Working with Chris Treml to have DICA products on site has been a great experience. Chris is a tremendous advocate for the mission of IUOE and we are proud to have partnered with such an excellent training organization and facility,” said Kris Koberg, CEO of DICA. “We liked that DICA outrigger pads are made using their engineered thermoplastic that won’t ever break, wear out, or need maintenance,” said Treml. Crane training at the International Training Center includes Level 1 fundamentals; Level 2, which includes crane setup, operations, techniques like catching the load, rigging, and signaling; and Level 3, which is advanced operations such as dual crane picks. For Level 2 training, operators will be required to handle outrigger pads as part of the proper crane setup procedures. To meet future OSHA requirements, the International Training Center also offers third-party accredited crane operator certification testing. NCCCO and OECP practical exams are conducted on pre-set courses marked by barriers. 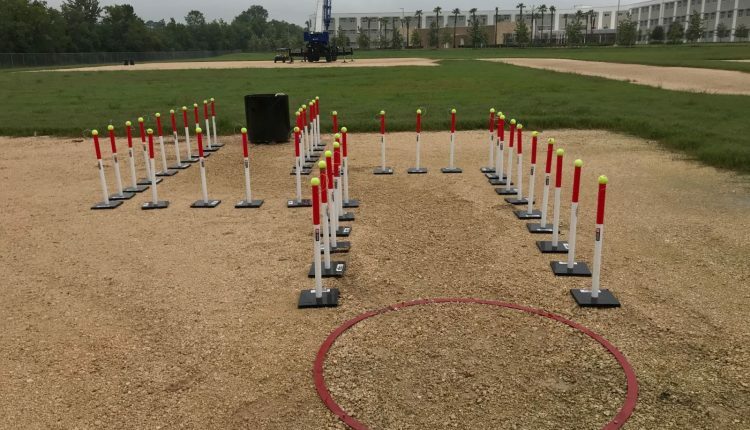 For this testing, the IUOE uses DICA’s TrainSmart Pole Barriers to create the courses. “We really like that DICA’s TrainSmart Pole Barriers are lightweight and will never need maintenance. They really take the wear and tear of repeated use,” said Treml. Thousands of IUOE members from around North America will come through the International Training Center per year. The world-class facility includes more than 8,000 sq. ft. of conference space, 15 classrooms and labs, a 12-pad crane field, simulators, and more. “We didn’t want our Locals to have to reinvent the wheel when it came to training,” said Treml. “This facility augments the great work they are doing.” As part of DICA’s partnership with the IUOE International Training Center, DICA will further support Local IUOE training efforts with its products and training materials.